But razib, upstate New York is not New England. I’ve never heard of “Greater New England.” As a kid in New Hampshire I always understood that New England was superior to New York state, which was mostly a nest of Dutchmen and Tories in 1776 anyway. I never heard of “Greater New England” explicitly until I read this article by Michael Lind. I say explicitly because implicitly the region is obvious. You even know this from the biographies of prominent New Englanders, the perigrinations of Joseph Smith and John Brown follow the arc of Greater New England, from New England proper into upstate New York, to northern Ohio, and finally New England settled enclaves in the West. This map of the 1856 election shows the outlines of Greater New England. In this election the Republican party had not broken out of its association with “Yankees,” which excludes the Patroons of New York and much of Pennsylvania, which remained aligned with the Democrats. In fact, even today the outlines of Greater New England remain politically, here is my estimate of the white vote for Obama. 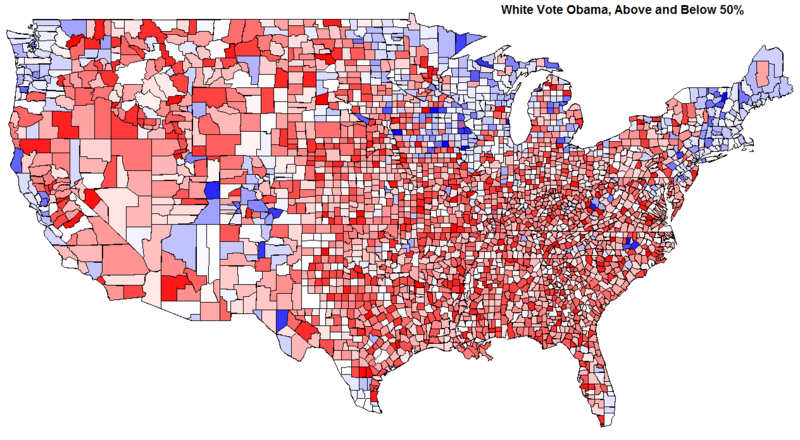 The areas which voted for the Republicans in 1856 are exactly those where more than 50% of whites voted for Obama (blue). Two books which I would highly recommend on this topic are Albion’s Seed and The Cousins’ Wars. In regards to the teaching of American history the focus is on major political and military events, the various wars, and a few cultural-structural shifts. In particular, immigration, race and the frontier. But another aspect which I think is just as important are the spatial configurations of British cultures which settled North America before the Revolution. Also, see Clash of Extremes: The Economic Origins of the Civil War. It documents how Greater New England arose on the backs of the canal building of the early 19th century, which shifted the economic focus of the Old Norwest/Midwets from the Mississippi and South to the east, as well as opening up an easy route for New Englanders to sweep across the northern fringe of the country. The Pennamite-Yankee War (or Wars) is the name given to fighting which occurred between 1769 and 1799 between settlers from Connecticut who claimed the land along the North Branch of the Susquehanna River in the present Wyoming Valley, and settlers from Pennsylvania who laid claim to the same territory. Because the combatants were from Connecticut and Pennsylvania, the wars are also known as the Yankee-Pennamite Wars. I always knew it, growing up in Albany, as Greater New York. Mass is heavily Catholic, and the Midwest has seen large immigration from Scandanavians, Germans, and Slavic peoples. While obviously there was a lot of transmission from Yankees -> others, I suspect some of these groups would have been progressive anyway. Meanwhile, the Yankee Mormons went hard-right. Wonder what happened there. why would catholics be progressive? white catholics are more liberal than white protestants, but only moderately. and that isn’t account for geography. the catholics in 1856 obviously voted against he republican party, which was the ‘anti-romish’ camp. is absurd and nakedly false. The only history professors I can think of who might teach that way are 90 year old white guys or presidential historians or war historians in specialized courses. Although my training is primarily in sociology, I would dare say that no one has framed American history that way since at least the social history movement of the late 1960s. dude, i’m talking to someone who was referring to themselves as a “kid.” so yeah, i’m talking high school and elementary school history. since i’m not RETARDED perhaps you could have connected the dots on the context instead of being so literal? christ. perhaps social history has gotten huge since the 1990s in high school, but i don’t think vanya’s that young. p.s. i linked to three books in the post, none of them were conventional narrative political history. you really think i don’t know what the emphasis in college is all about? Anecdotal: two lines of my ancestors (at the great-grandparent level)stayed for a generation or two in upstate NY before migrating to Iowa. Peripheral: Mormons and Women’s suffrage. Mormons favored women’s suffrage so that their wives could support Mormon causes, including polygamy, in the ballot box. Damn. That should be “two lines of my New England ancestors”. Three words – Finger Lake Finns. They all arrived well after the Civil War. (My grandfather settled there after WWI.) They were mostly coming from other states too, Minnesota, Wisconsin, and Michigan. As noted in number #5 this is how history was taught 40 years ago in high school. Yes clearly there have been changes Ken Burns shows a different kind of history in his works for example. Also the number of writings analyzing politics 1852-1865 show many interesting features. Another would be the book Reelecting Lincoln (it was a close thing until Atlanta fell). I do note that one line of ancestors went 1630 MA, CT, upstate NY, MI, and finally IA. If you think about it (I assume american studies has done this) There are two basic trends in US history the one that started in MA which holds the US out to be the shining city on a hill, and the other which started in Jamestown, as well as NY with the Dutch, that to quote Coolidge “the business of the US is business”. These differences run thru our history grating against each other as well as leading to advancements. Yes clearly there have been changes Ken Burns shows a different kind of history in his works for example. isn’t the civil war documentary still his big seller in the public schools? i probably saw that 3 times in high school. lazy teachers. 1948-1968 or so there was a well-known relignment, such that the South went from solid Democratic (1944) to solid Republican. Simplifying, you could call this the “social conservative” switch. 1892-1932 there was another, messier switch which you could call the populist / progressive switch. Before 1892 the two parties had been about equally free-market conservative. POlitics was Southern Protestants + Northern Catholics vs. Northern Protestants, with the Midwest and West the battleground and also a hotbed of dissidence. In the 1890s Populist challenges were successful in the West and threatening in the South, and Democrats met the populists halfway by nominating Bryan three times, but many Democrats deserted Bryan, who lost three times. In 1912 Roosevelt split the Republican Party and Wilson was elected. Wilson was actually not very progressive but in 1914 he passed some progressive (or liberals) legislation which probably won him the 1916 election. But he tended to revert to conservativiam after being elected. The Democratic Party wasn’t completely transformed — their 1924 and 1928 candidates were still conservative, and FDR was fairly so when elected. But his responses to events made him the founder of welfare (economic) liberalism. This wasn’t a realignment — Democrats kept the South and the Catholics, but the Democrats became economically liberal in the sense of intervening in the economy and spending government money of relief measures of various sorts. By 1952 a weakened version of economic liberalism took over the Republican Party. So roughly, Catholics have always been Democrats but became liberal in 1932 or somewhat before. Cultural liberalism was a post-WWII development, and some Catholics followed and some did not. When talking politics, it counts as a victory if you cut into the opponents’ base. If Republicans got 20% of the Black vote, 30% of the Jewish vote, and 45% of the labor / Catholic / Hispanic vote, they would win in a landslide. The history of the name of Oregon’s capital makes for a great illustration of this principle.